Mario Party returns for an all-new installment, but this time it's in the palm of your hand! As usual the game comes with a single-player story mode and a multiplayer party mode. There are also 60 all-new minigames to take part in this time around. In the Story Mode, Bowser is up to his dirty tricks again, and to track him and his Bowser Juniors down you will have to travel around a game board, playing minigames to beat the little Koopas at their own game. 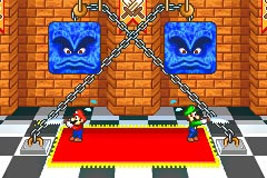 The multiplayer mode is the same, only you are playing against up to three human players, each a popular Mario character. By playing minigames you earn coins, and you can spend these coins on Prof. E. Gadd's "Gaddgets". The Gaddgets allow you to play tricks on your opponents, as well as letting you test the compatibility of players and so on.